In this fully updated second edition, expert dieticians Sue Baic and Nigel Denby provide no-nonsense advice, equipping you with all the information you need to make informed decisions about your diet. The book acts as a sound reference point if you want to know the facts about food, and debunks the myths behind fad diets. 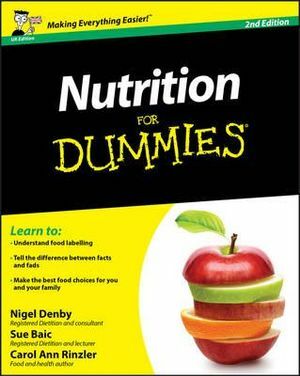 Nutrition For Dummies, 2nd Edition provides a detailed understanding of the nutritional breakdown of different food groups and examines the relationship food has with one's physical and mental wellbeing. The book also advises you on how to establish healthy eating patterns and how to maximise the health benefits of what you eat. This new edition includes approx 20% new and updated material, including new chapters on nutrition in institutions and how to eat healthily on the go. New content also includes up-to-date health guidelines and government policies, information on probiotics and over the counter weight loss drugs, plus advice on how to eat well on a budget.